Some people are lucky enough to have smooth, plump, youthful-looking skin – it’s just their natural complexion; however, for others, achieving this ‘perfect’ skin requires a visit or two to a professional dermatologist. Dermal fillers are an effective way to lift wrinkles and rejuvenate the face and, over the last few years, they have become increasingly popular with both men and women. If you’re thinking about getting dermal fillers, be sure to do some research first. It’s quite a big decision to make and, before you book your first appointment, you should understand exactly what they are and exactly how they work. In the following blog, we have compiled a simple beginner’s guide to dermal fillers, including some of the most frequently asked questions about this cosmetic procedure and everything our experts think you should know – before you decide to opt-in. Dermal fillers are, essentially, small facial injections of gel and they can be applied to various different parts of the face – including around the eyes, cheeks, mouth and jawline. As we get older, our body stops producing two proteins that are vital for a youthful complexion: collagen and elastin. Experts now believe that we start to lose collagen in our early 20s and by the time we reach 30, production has ceased entirely. This is where dermal fillers come into play. This anti-ageing cosmetic procedure effectively does the job of collagen, instantly restoring volume in the skin and smoothing out any wrinkles or creases that have started to form. Are there different types of dermal filler? There are a few different types of facial injection currently available; however, the two most popular include hyaluronic acid fillers and collagen stimulators. Hyaluronic acid fillers (such as Juvederm®) are made from a natural acid that is found in many areas of the body. This acid or gel-like substance can hold up to 1000 times its weight in water and, as such, it helps to hydrate, moisturise, and plump the skin. Results can be seen immediately; however, because the body starts to reabsorb the acid, the effects only tend to last between 6-9 months. By contrast, collagen stimulators (also known as Sculptra® Aesthetic) are made from poly-L-lactic acid and – rather than ‘fill in’ the wrinkles – they are designed to stimulate the skin’s natural collagen production. The effects appear more gradually than hyaluronic acid fillers, but they are likely to last for a much longer period of time. On average, this non-invasive procedure takes around 30 minutes to complete and most clients are able to carry on with their normal daily activities afterwards. The dermatologist will simply use a fine needle and syringe to inject the dermal filler under the surface of the skin – staying at a shallow level for fine lines, yet penetrating slightly deeper for more severe wrinkles and folds. They will ensure the filler is applied evenly in the chosen treatment area, taking care to minimise any discomfort. Pain is very subjective and, when it comes to dermal fillers, the level experienced differs from person-to-person. 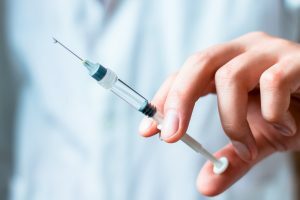 It’s reasonable to expect some slight discomfort when the filler is being injected into the soft tissue of the skin and, if you’re anxious about the procedure, this can seem worse. However, every effort is made to make you feel as comfortable as possible and – if necessary – a local anaesthetic can be applied to numb the area and reduce the pain and discomfort. Following the procedure, the treated area is also likely to be sensitive for up to 24 hours and it is common to experience bruising, swelling, and tenderness. These side effects can be a little inconvenient; however, they are usually mild, and they will disappear shortly after the procedure. The cost of facial injections depends on how much you have done and whether you choose to have collagen injections or hyaluronic acid fillers – but they’re probably not as expensive as you might think. Here at Aesthetics of Essex, we charge between £185-£550 for this cosmetic procedure and the amount of dermal filler you require will be discussed at an initial free consultation. If you would like to fight the inevitable signs of ageing, dermal fillers are an effective non-invasive option that leads to fantastic results. For more information on the procedures available, here at Aesthetics of Essex, please feel free to get in touch at any time. Our team of experts are extremely knowledgeable in this area and they will happily answer any of your questions and queries regarding the different types of facial injection. So why not give us a call on 01708 225555 or, if you’re ready to make the first step towards getting filler injections, book your free consultation today!